Working together, MATRIC and a customer’s technical team developed technology for processing algal oil to yield desired ester products. After demonstration in the laboratory, a continuous pilot plant was designed and constructed. 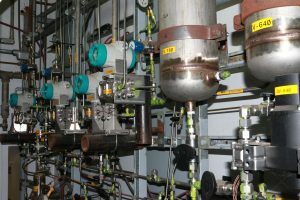 With a budget of approximately $1M, this pilot plant included eight major capital items and 26 instruments, and it was completed under budget and ahead of schedule. Several pilot plant campaigns were conducted, in which large quantities of algal oil were successfully processed. – For additional information, please contact communications@matricinnovates.com.